Just like we predicted last year, Python has exploded in popularity in the embedded world. With the Web and Enterprise categories already conquered, it was time for new achievements. But what about GitHub, the world’s most popular code repository? What do the statistics say about the use of Python there? Well, according to their report for the second quarter of 2018, Python ranks in second for the number of pull requests, pushes, and stars. If you take a look at the image, you’ll also see the Python curve is still on the rise. But let’s not stop our report now, before we see what the hacker community thinks. It’s one thing to see an official report, and it’s quite another to see what the actual people who are using those programming languages think. It’s clear that Python is on a rise like no other programming language in recent years. 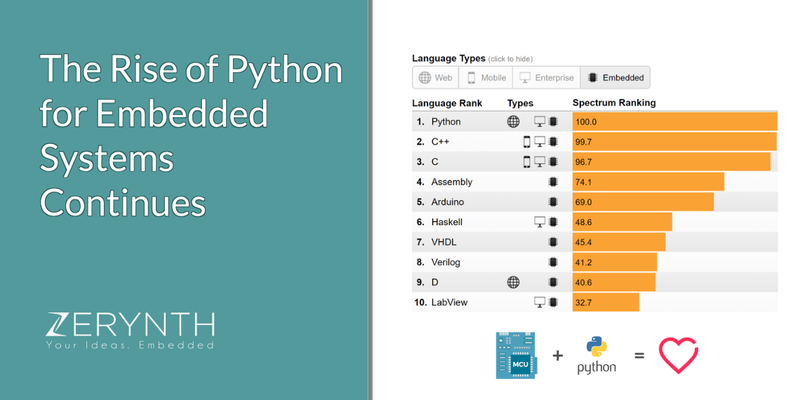 We can’t say that we are surprised by this turn of events, but we are glad that Python is now listed as an embedded language. Last year we wrote an article where we said that Python should rightly be in the embedded category since the rise of Python-based embedded platforms was really considerable. Compiled languages have now made an opening to Python in this category, most probably because microcontrollers now have more power to host a Python Virtual Machine. Zerynth is certainly recognized in the community as a vital part of Python’s rise in the embedded category. And where’s better to turn for the opinion of people than Quora – a place where the community both askes and answers the questions on everyone’s mind. One user posted this question “Are Python implementations like Zerynth and Micropython gaining popularity in the embedded systems market?”. Which of course reflects on the whole embedded community thinking the same thing. There is a huge switch from traditional C programming to Python. Visit the thread if you want to join in on the discussion. Zerynth simplifies IoT development providing an easy and efficient way to program the most popular 32-bit microcontrollers in Python and connect them to the top Cloud infrastructures, with high-level standards of security. With headquarters in Pisa, Italy, and a global sales team, Zerynth is helping thousands of developers around the world to develop new IoT products and Industry 4.0 applications with reduced costs and improved time-to-market. In the light of our recent technological partnerships with some of the leading companies in the IoT industry, we can proudly say that Zerynth has reached new heights. Questions about our tools are coming from every corner. Some of the top magazines in the industry are recommending Zerynth tools for easy embedded development. They move further to say that Zeryth is the middleware for IoT and a recommendation for embedded programming in Python. The bond with the embedded community grew even stronger recently. The RS Components partnership brought the Zerynth Studio middleware toolkit right to DesignSpark. The whole community of engineers now have access to our tools, and they can download it from DesignSpark. On the other hand, an amazing IoT toolkit is on the market through the XinaBox technological partnership with Zerynth. The XK12 IoT Starter Kit already has a Zerynth license onboard (just like the 4ZeroBox). It’s a perfect combination of XinaBox’s modular electronics and our ecosystem of software tools in Python. Now that we mention the 4ZeroBox, it’s a good opportunity to explain what it does. The 4ZeroBox is part of the 4ZeroPlatform – a Python programmable plug-and-play data gathering, processing, and reporting solution. It’s a complete, adaptable and Machine/Cloud independent IoT Stack composed of a smart acquisition unit (4ZeroBox) and a Cloud analytics and dashboard (4ZeroManager). You can learn more about it on TOI’s official website. And let’s not forget our partnership with Mouser Electronics, the worldwide leading semiconductor and electronic component distributor. Lastly, we crowned all this recent success with The Things Conference Italy, that’s to be held on October 11th in Pisa. The conference is taking place at the GATE Centre, where the Zerynth R&D offices are. It’s a full day dedicated to learning about LoRaWAN and Python for IoT and industry 4.0 applications. Experts from all over the world will be holding workshops and keynotes. It certainly feels great, because sharing knowledge is one of the best ways to celebrate. Since security issues rank so high in the IoT industry of today, we were thrilled to announce our technological partnership with Microchip, one of the top providers of embedded security solutions. Shortly after, Microchip listed Zerynth as a Trusted IoT Platform Partner, with our tutorial for “Zero Touch Secure Provisioning for AWS IoT using Python”. Moving down the list of popular topics in the embedded industry, we tackled the filed of ESP32-based devices, with numerous tutorials, designed to help our users in the connected projects. That’s when Espressif Systems took notice, a semiconductor company focused on developing WiFi-and-Bluetooth, low-power, IoT solutions, famous for the ESP32 MCU. They published an article that features all the Zerynth tutorials for ESP32-based devices. An interesting and useful overview, for any skill level. Zerynth already had a solid understanding and cooperation with Espressif Systems. Last year they recommended Zerynth as a professional firmware toolkit for ESP32. Sharing knowledge and gaining new skills in one of the best aspects of the IoT industry, so we were very happy to be included in the popular Udemy course on “Exploring AWS IoT – Device to Cloud integration: Programming WiFi enabled Embedded Devices, and transmitting data to AWS IoT.” It’s a great course for anyone who wants to learn the basics of programming WiFi-enabled embedded devices. If you want to learn more about working with AWS and Zerynth tools, you can always check out our tutorial on Firmware Over-the-air updates via AWS. If you want to join the Python revolution download Zerynth Studio. After all, it’s the gateway to the Zerynth ecosystem of tools. You can register for a free user account and get 10 Zerynth Virtual Machines Licenses (which can be used on any of our supported boards). Our set of tools will allow you to go from idea to firmware development to connecting your device to the cloud in no time. Thanks to our extensive collection of libraries this whole process is simplified. And if you ever get stuck, there is a ton of Zerynth Academy tutorials to help you on your way. There’s something for every skill and knowledge level. You’ll get a chance to learn simple things like how to read an analog sensor with Zerynth Studio, and how to uplink a project and move on to more complex things like Firmware-over-the-air updates. We are regularly adding new tutorials to the Academy, some of which handle the trending topics in the industry. Like our recent post on how to use Python on microcontrollers for Blockchain and IoT applications.